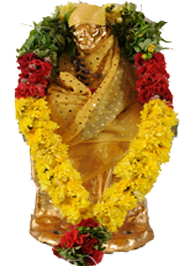 Sri Naga Sai Mandir (Sai Baba Kovil) Mettupalayam Road, Coimbatore. On 18th October, 2018, Sadguru Shri Saibaba Samadhi Embrace will attain 100 years at Shirdi. This auspicious occasion is of extra ordinary significance and life-time memories for Shri Saibaba Sansthan Trust Shirdi as well as Sai devotees all over world. Hence, Shri Saibaba Sansthan Trust, Shirdi has decided to celebrate this holy event as a grand festival, starting from 1st October, 2017 to 18th October, 2018. 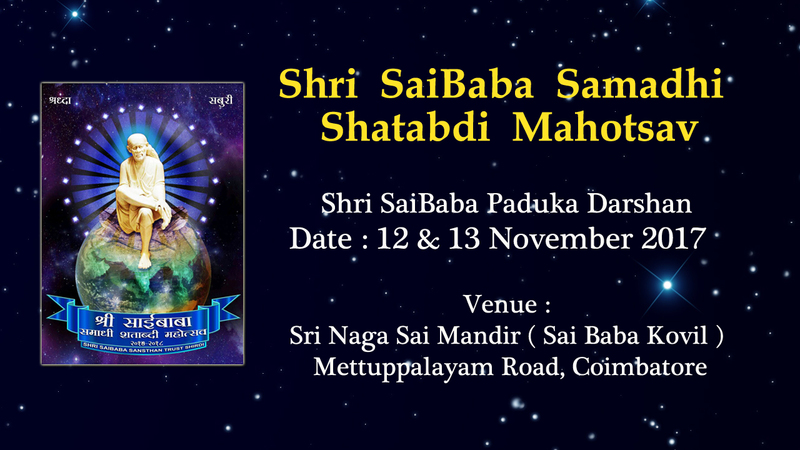 On this auspicious occasion, Shri Saibaba Sansthan Trust, Shirdi has planned grand festival “Shri Sai Paduka Darshan” organized at Sri Naga Sai Mandir (Sai Baba Kovil) Coimbatore on 12th and 13th November 2017. (We are blessed and honoured to have orginal Sai Paduka will be carried from Shirdi by Shri Saibaba Sansthan Trust, Shirdi for darshan). This event will serve as a life time opportunity for devotees to celebrate Centenary Year of Shri Saibaba’s Samadhi, in Tamil Nadu.